A hazard means any source of potential damage, harm or other adverse effect on the health or safety of any person during the course of work. The Hazards Registry Report page contains all the submissions of the users using the form. 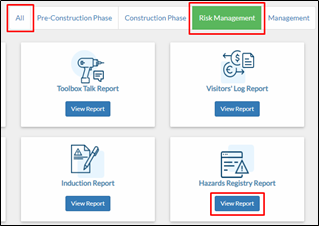 Project Page – Click Risk Management tab > View on Hazards Registry form tile. Projects Dashboard – Click the Reports button. Locate the Hazards Registry Report then click View Report. This can be found under All or Risk Management tab. 2. You will be redirected to Hazards Registry Report page where you can view all the submissions.